About 80 passengers had to be evacuated from a train after smoke started to billow from it amid reports of a fire. 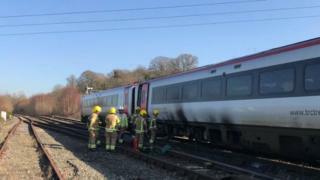 The fire was reported on the Manchester Piccadilly-Milford Haven service, Transport for Wales said, as it passed through Pontrilas, Herefordshire. One witness said the train stopped shortly after 11.00 GMT, smoke was seen and passengers were asked to move carriages before getting out. West Midlands Ambulance Service attended but no-one needed treatment. "Then the staff kind of advised us to all move to carriage number one and then the fire brigade came and then the smoke just kind of continued for the next 30 minutes." The train stopped very close to the border with Wales. Pontrilas post office manager Nigel Kolca said the train was 20m away from the premises and he passed taxi details to rail passengers. He said: "Some of them came in and asked for our help... They had to jump out of the door (of the train) because there is no platform. "(There was) heavy smoke... very grey white smoke." The fire service said it found smoke rising from the second of three carriages, but no flames. Image caption Transport for Wales said its train crew worked "quickly and professionally to get all customers off safely"
Earlier, operations director for Transport for Wales Martyn Brennan said a fire took place under one of its trains and a full investigation into the cause of the incident would be carried out. He said: "Thankfully no one was hurt and our train crew worked quickly and professionally to get all customers off safely and onward road transport has been arranged." The firm apologised to all those affected and said replacement buses were arranged between Newport and Shrewsbury.